A mischievous monster has invaded the pages of your book! Tom Fletcher's warm, witty and perfectly-judged narrative voice brings this wonderfully inventive debut solo picture book to life, inviting readers to create magic inside the book. Children will love interacting by tilting, spinning, shaking and blowing, and then seeing the impact as each page is turned. A fantastic celebration of all the fun that can be had with a book, with a wonderful wind-down bedtime ending! From a career as a song-writer and global superstar with the band McFly, Tom Fletcher has gone on to become one of Britain’s best-loved children’s storytellers. Along with fellow band-member, Dougie Poynter he penned the phenomenally successful The Dinosaur That Pooped books as well as solo projects including 2016’s Christmas bestseller, The Christmasaurus. 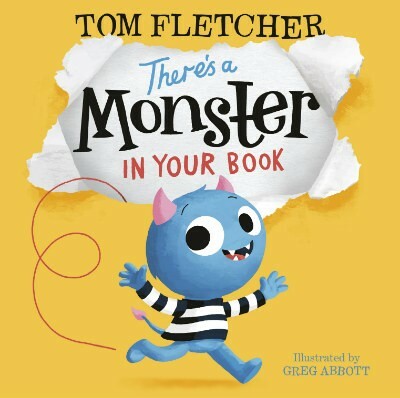 McFly songwriter, lead vocalist and guitarist Tom Fletcher entered into the field of children’s books in 2012 with The Dinosaur that Pooped Christmas, the bestselling picture book co-authored with band-mate Dougie Poynter. In 2016, Tom Fletcher released his first solo writing project The Christmasaurus, a book that immediately caught the imaginations of children across the country and has been seen as something of an instant classic. With wife Giovanna Fletcher, Tom has undertaken a new series of dystopian novels beginning with Eve of Man. A fabulous interactive book by Tom Fletcher, this will have children laughing out loud! Not only laughing but shouting, tilting, blowing and spinning the book! An excellent book to wind down before bedtime.